Free teacher and student resources for the study of English as a foreign language. Reading resources, grammar resources, and games. Get instant access to the Linguapress English grammar for android phones and tablets from Google Play store. Free app; no intrusive ads, no login. Linguapress.com is a portal for teachers and learners of English as a foreign language (EFL) and English as a second language (ESL) or English for Speakers of Other Languages (ESOL). In the UK, a CFBT report published by the British Council in 2007 suggested that the former distinction between EFL (English for school or adult students learning a foreign language) and ESL or ESOL (English aimed at immigrant populations needing to become proficient in the national language of their new country of abode) was no longer very helpful. Linguapress has held this view for many years. While aimed primarily at EFL learners worldwide, resources on Linguapress.com, with their language and cultural content, are in many cases equally appropriate for learners acquiring English as a second language whether in Britain or the USA. (d) Other pages with information for teachers and students of English as a foreign language, including studying English in England, choosing an English language school, the story of English, and more. This archive of articles, together with the classroom teaching material to accompany it, is the bedrock of the new Linguapress.com. Linguapress welcomes new content and classroom resources from writers and teachers. All articles and teaching material published on this website remain the copyright © of Linguapress, except where otherwise stated. Reproduction of LInguapress material for classroom use. Feel free to copy or print pages from Linguapress for use in your class: but please note the following points. Do not copy entire pages, or long extracts from any Linguapress web page, to your own website. This is a violation of copyright. Instead, link directly to the Linguapress.com website pages you want students to view. If you copy any extract from a page on this website, for use on your school's or personal online teaching platform (Moodle or other platform, and whether access is open or restricted), you must include a clickable link to Linguapress.com from your website, to acknowledge the source. If you develop extra classroom exercises or activities to accompany an article from Linguapress.com, let us know. Use the contact form link below, to get in touch. Within the EU, in all schools declaring the source of polycopied material within the framework of European educational copyright agreements, any copying of articles from this site for use in the classroom, must be attributed to Linguapress, France. In France, copying is declared by schools to the Centre Francais d'Exploitation du Droit de Copie, or CFEDC. If you have a moment, send us an email to let us know what you have used. Oxford University Arts and Humanities community resources database. 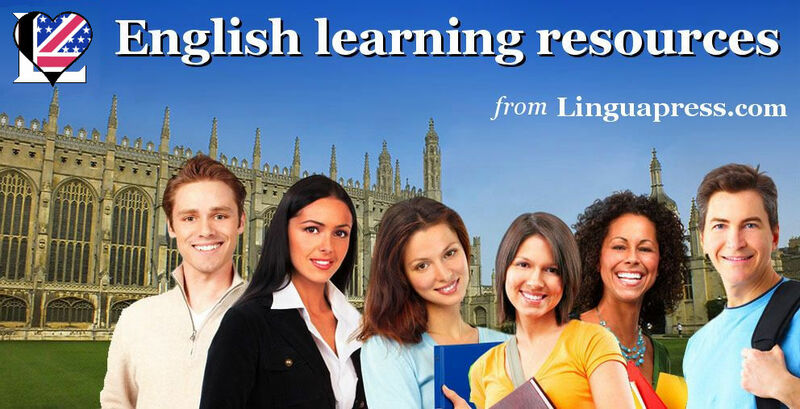 Cambridge University press - Cambridge Encyclopedia of the English language - further resources. LInguapress.com does not collect any personal information about users, and does not maintain any user or email database. Cookies are used only for statistical analysis such as tracking the most popular pages and the geographic location of visitors; they cannot collect any personal information. Many pages have links to third party sites, including advertising links, that may set their own cookies. This is normal practice. Linguapress has no control over cookies set by third party sites accessible through hyperlinks. Users have the ability to block cookies through their browser tools, but should be aware that blocking cookies will prevent communication between computers, which is essential for many functions such as social media, logging-in or other actions.